Jazz had her first birthday celebration this afternoon at Misty Pines Dog Park. We were joined by friends and family, human and canine, for this happy event. We played games with the dogs and enjoyed good food and good company. Friends came from as far as Ohio and New Jersey to attend the party. This is a photo of everyone playing doggie musical chairs. Jazz was joined on her birthday by two of her liver brothers and her mom. Left to right, it's Jazz, brother Peet, mom Gia, and brother Patrick, who traveled with his family all the way from Cape May, NJ! Here's Jazz getting ready to enjoy some of her yummy birthday cake. There are definitely advantages to being the birthday girl, like being the first to have a piece of birthday cake! Thanks to all our friends and family who came to celebrate Jazz's birthday with us. It was a very special day. Jazz is just in heaven with all the wonderful gifts she received...and Tess promises to help her play with all of them!! We're celebrating Jazz's first birthday today! I wanted to post some "then and now" photos of our beautiful pup. A little later, Jazz is getting together with many of her canine friends, as well as a few of her littermates, for a birthday party. More photos to come! 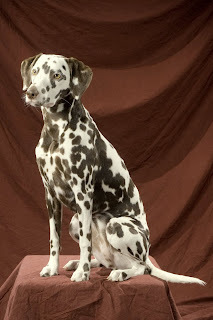 Tess and Jim traveled to Washingtonville, Ohio, today for an AKC agility trial. 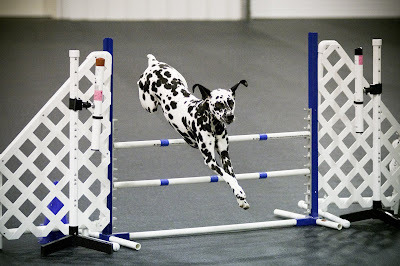 Tess received first place qualifying scores in both Open Standard and Open Jumpers with Weaves and earned her Open Agility Jumpers (OAJ) title. That's our girl! Happy Thanksgiving. 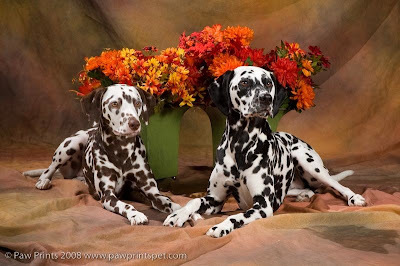 You can bet that we count these two spotted girls among our Thanksgiving blessings! Just wanted to post this recent fall portrait of Jazz and Tess. 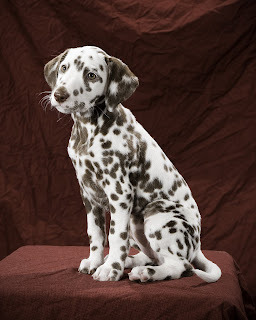 Another great photo from our friends Virgil and Rebecca at Paw Prints Pet Photography!